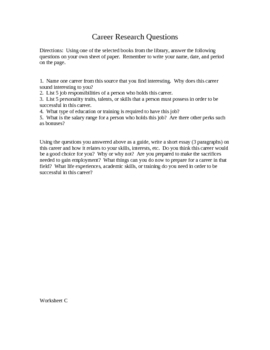 Career Research Worksheet for Library - with inclusion version! This one-page worksheet is designed to help middle school students study their career interests using library books. This is a self-explanatory worksheet that is terrific for a sub! Simply pull some career books from your library for the students to use or direct them to the career section of your library. The worksheet includes 3 versions: one for regular education students, one for inclusion students, and one for honors/advanced students. Or, you could use the different versions for different grade levels.